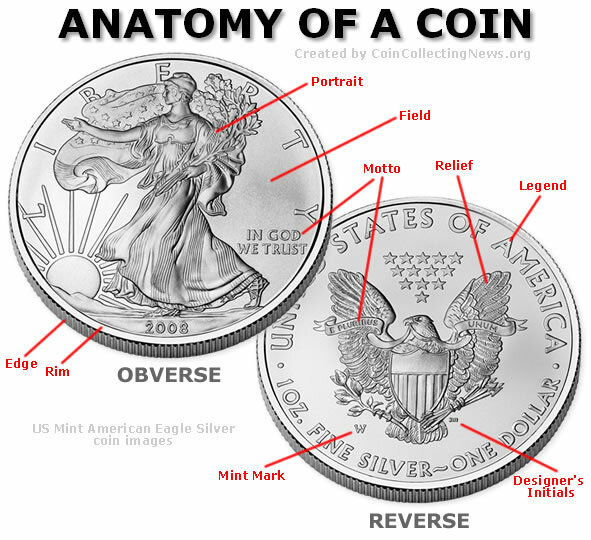 The anatomy of silver coins, or any coin for that matter, is depicted in the following American Eagle Silver coin image. Term descriptions are provided below as well. Obverse: The top of heads side of a coin. Usually the side with the coin’s date and portrait design. Reverse: The back or tails side of a coins. Rim: The raised edge on both sides that runs completely around a coin. The design helps protect a coin’s design from wear, and makes coins easier to stack. Edge: Often called the "third side" of a coin, the edge is the very outer border of a coin. Edges can be lettered, like the new U.S. Presidential $1 coins, plain, reeded, or decorated. Legend: The main letters, often referred to the coin’s inscription. Motto: Coin lettering or inscriptions like "In God We Trust," "E Pluribus Unum," and "Liberty." Mint Mark: The always small letter or symbol on a coin that indicates where a coin was minted. In the U.S., common mint marks include Philadelphia "P", Denver "D", San Francisco "S", and West Point "W."
Portrait: Generally, the main part of a coin’s design. Common portraits include presidents, kings, queens, and Liberty. Field: The flat area of a coin’s surface that is not raised and doesn’t have any design or inscription. Relief: The part of a coin’s design that is raised above the surface. Date: Indicates the year a coin was minted or first issued. Designers Initials: The initials of the person who designed the coin. Coin image courtesy of Coin Collecting News.